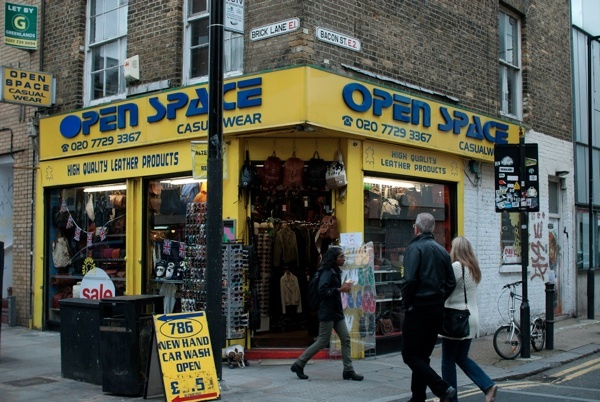 Not so long ago, almost all the shops north of the railway bridge in Brick Lane sold leather jackets and bags manufactured locally, but now there are only a handful of these businesses left. 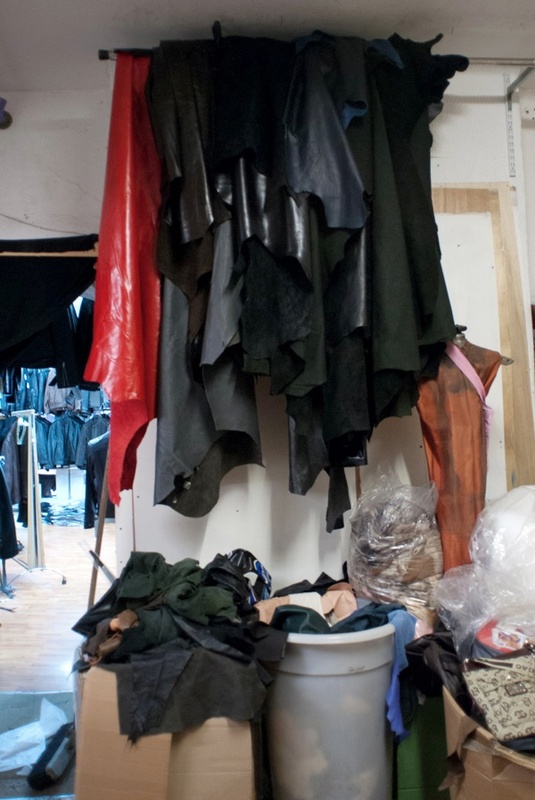 So Spitalfields Life Contributing Photographer Sarah Ainslie and I went along to find out what is going on in the world of East End leather, and we encountered an entire spectrum of human emotion. 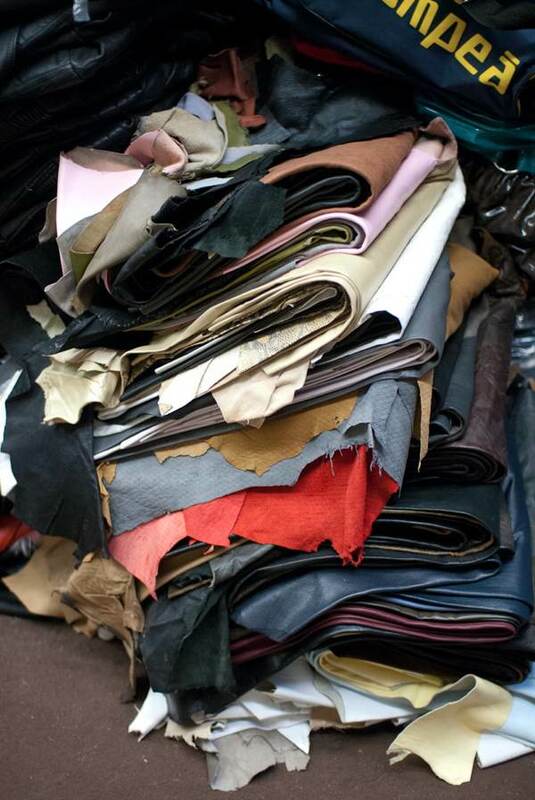 The manufacture of leather garments is an age-old industry on this side of London, existing as part of the clothing and textile trade that was a major source of employment here for centuries. A hundred years ago, the industry was predominantly Jewish but when Asian people arrived in significant numbers in the last century they worked as machinists in a trade that they eventually took over and now, a generation later, they find themselves presiding over its slow demise. 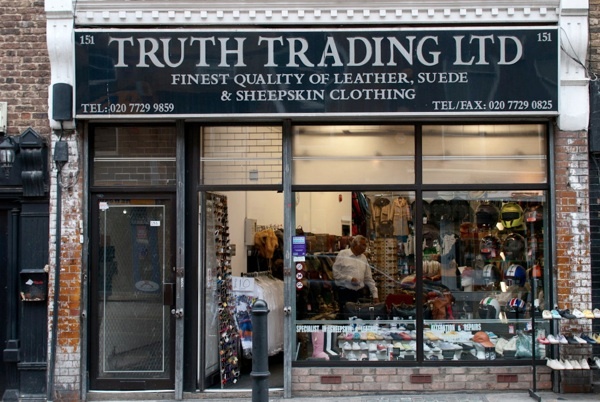 At Truth Trading, 151 Brick Lane, I encountered the father and son in a family business that began in 1978, sitting facing each other across a desk in an empty shop. “It’s dead! I make but I can’t sell,” declared Abdul Bari, leaping up almost apoplectic with frustration at the seventeen pounds they had taken that day, while his son sat watching with visible concern for his father’s distress. A skilled man who trained as a cutter and knew everything there is to know about the making of leather garments, Abdul Bari worked in the trade locally since 1968. 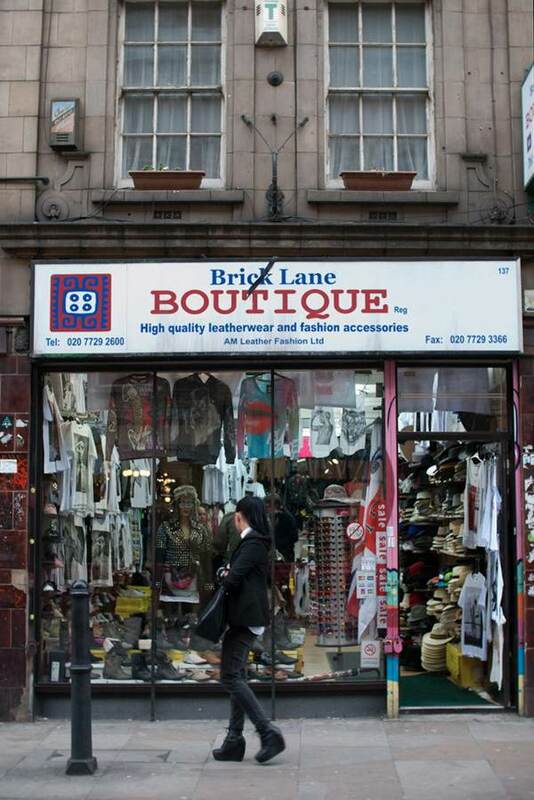 Then he started making clothes at home before opening a shop in Commercial St, graduating through premises in Wentworth St and Bell Lane, then purchasing the Brick Lane premises in 1986. “We have a factory in Pakistan with one hundred sewing machines but it is closed down because there are no orders,” he lamented, leaving me searching for words that might console him. 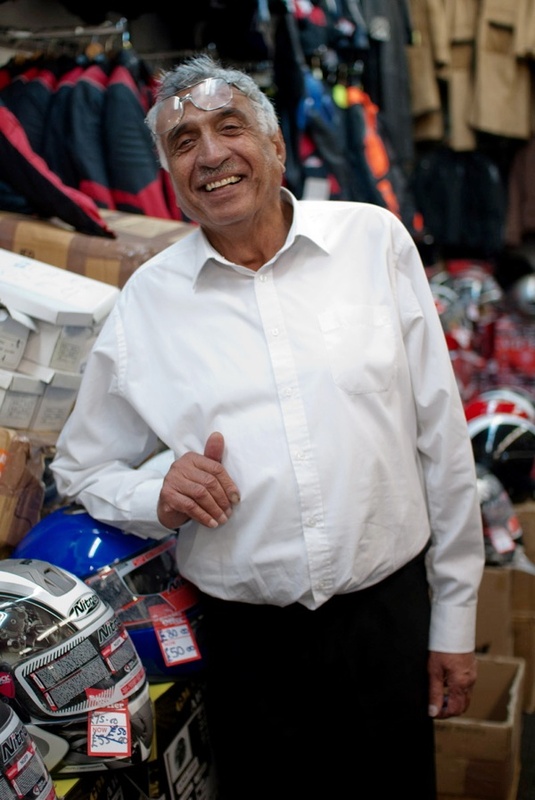 Across the road in the compact corner shop packed with glistening leather, Open Space, 200 Brick Lane, Mohammed Kamran was resolutely cheerful, explaining that his uncle Mohammed Yusuf Nagory started the business, making leather jeans and selling them at Kensington Market in the seventies. Moving to Brick Lane in the eighties, he started a factory with twenty-five people in Cheshire St which his nephew joined at fifteen years old. 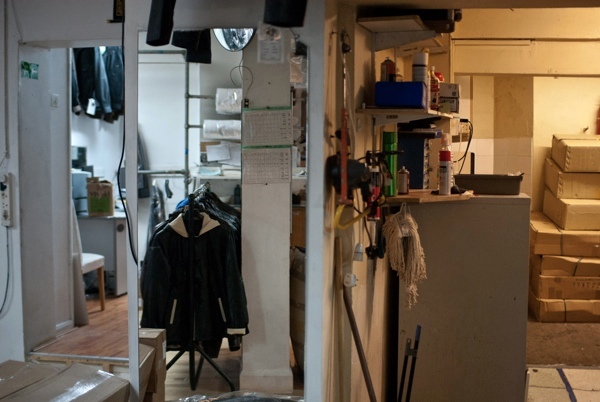 Today, as a smaller business they are sustained by loyal customers and have recently made costumes for Harry Potter and the West End theatre. 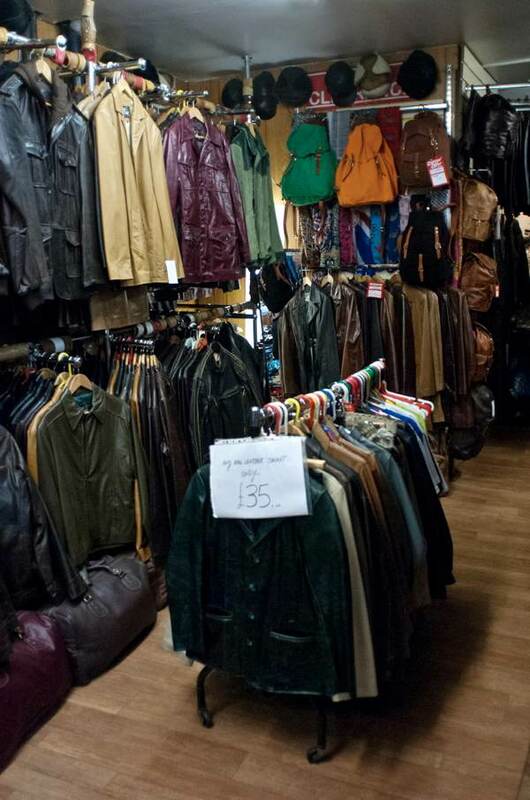 Astonishingly, you can buy a handmade leather jacket there for as little as thirty-five pounds. 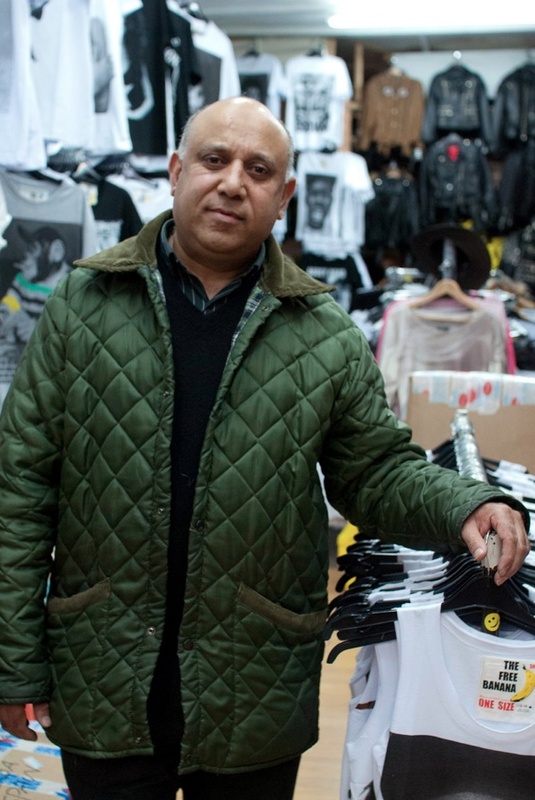 Mr Mahmood at the Brick Lane Boutique, 137 Brick Lane, who began working as a machinist twenty-six years ago and started his own business twenty years ago, explained the root of the problem to me. 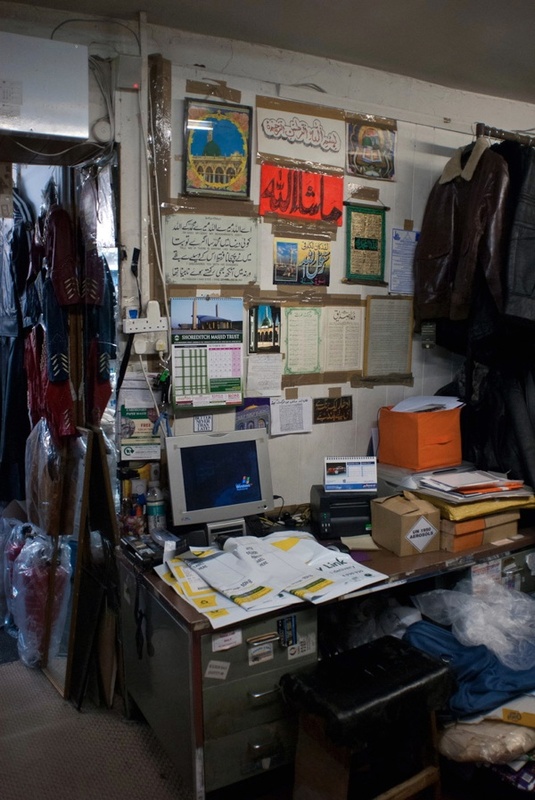 “When I started here, I used to sell everything I made, but now the Chinese use artificial leather and in the chain stores people can buy one of these jackets for £15. 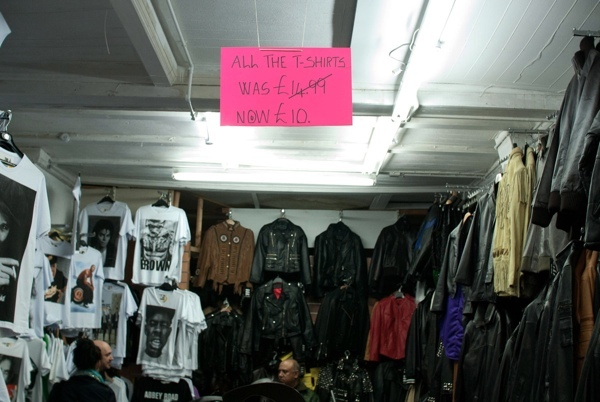 So why are they going to come here and spend £100 for real leather?” he asked, his eyes glistening with emotion as he gestured around his shop which was more-than-half given over to t-shirts, with leather jackets consigned to a corner. 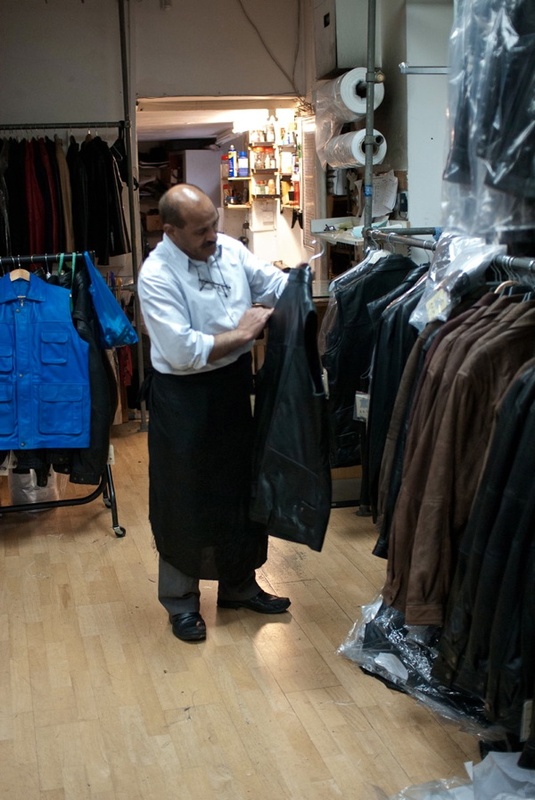 Fortunately our conversation was interrupted by a customer who did want to spend £100 for a real leather jacket and so I left Mr Mahmood to it, thankful that his salesmanship had been given an opportunity to shine. 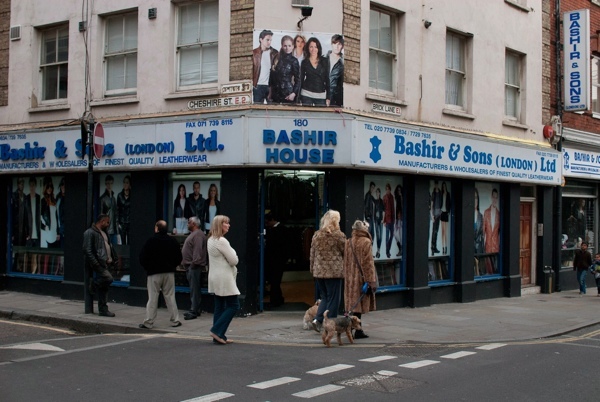 Further down, at 168 Brick Lane, another Ahmed, proprietor of Oceanic Leather was the most frank of the leather sellers, in spite of his self-effacing demeanour. “A lot of people left or went bankrupt. We had a regular business and then one day it dried up.” he revealed with a melancholy frown, “I’ve suffered pain, but I rode out the worst part of it.” In his store, everything has been made in the workshop above, though there is nothing to indicate this to customers, just piles of pieces of high quality leather stacked up in the crowded space attesting to the distinction of the garments on display. 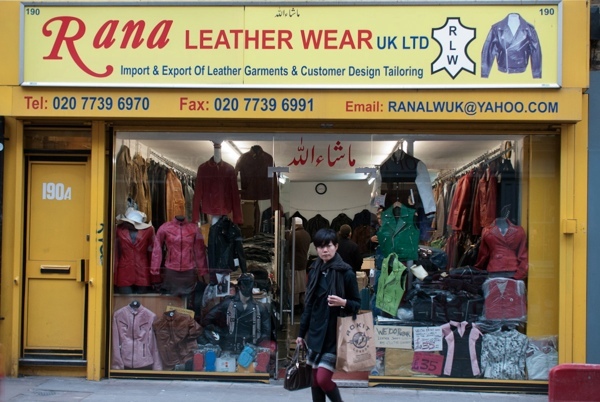 My final call was Rana Leather, 160 Brick Lane, where I discovered the proprietor Mr Rana and his beefy assistant trying to squash an impossibly large number of leather jackets into a tiny cardboard box. The beefy assistant held the box shut while Mr Rana wrapped it in tape and they succeeded in packing a curious irregularly-shaped parcel. Afterwards, Mr Rana wiped perspiration from his brow while explaining that he was one of three brothers who ran the business which started on Fashion St in 1975. 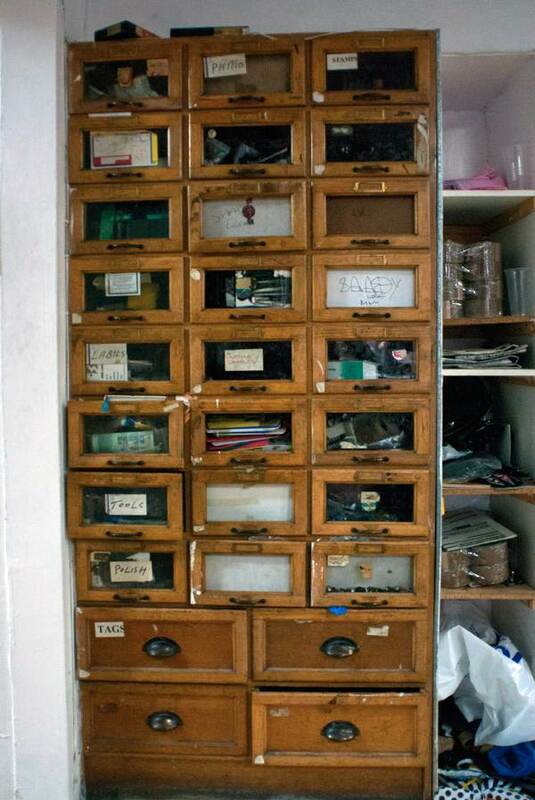 This busy shop was filled with boxes of clothes in transit, as much a warehouse for the wholesale trade as a retail outlet, and it indicated that a certain volume of business was being done on the premises. All but one of the leather shops I visited owned their buildings, which proved to be the key factor in their survival when others that paid the escalating rents had gone. I was fascinated to find that most were run by skilled men, experienced leatherworkers who offer the facility to have clothes and bags made to order. It was even more remarkable to learn that for a modest price you can buy a good quality jacket which has been made by hand in a workshop on Brick Lane. There may be only a few left, but my discovery was that these leather shops still have plenty going for them – if people only knew. 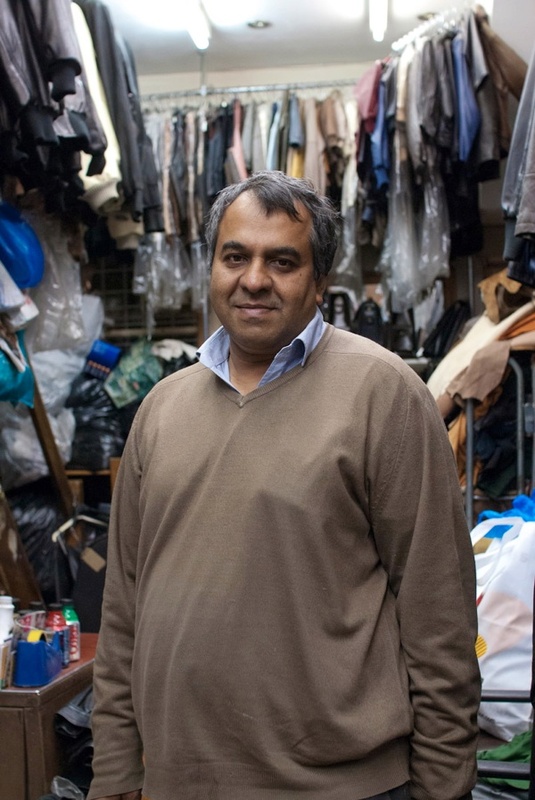 Abdul Bari, Truth Trading, founded his business by making clothes at home in 1978. 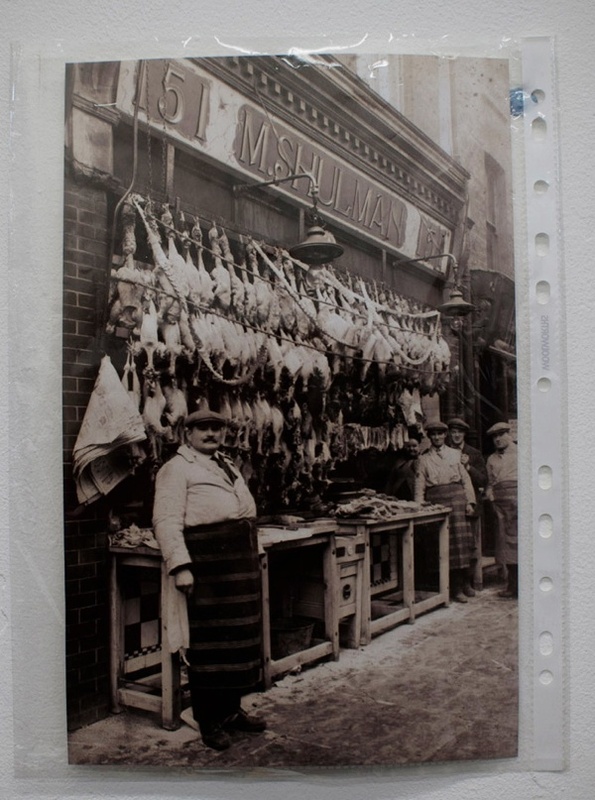 The grandchildren of M.Schulman, the kosher poulterer, gave this photo to Truth Trading, now operating from the same premises. 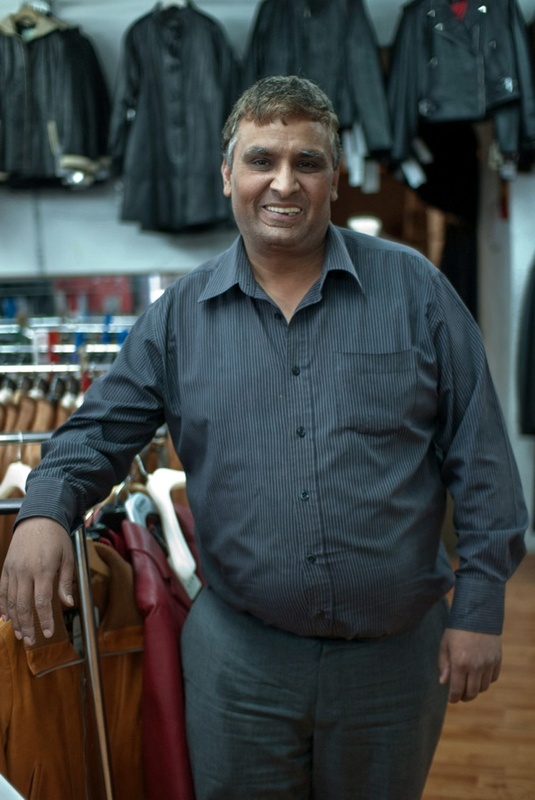 Mohammed Kamran’s uncle founded the business, Open Space, by selling leather jeans in Kensington Market in the seventies. 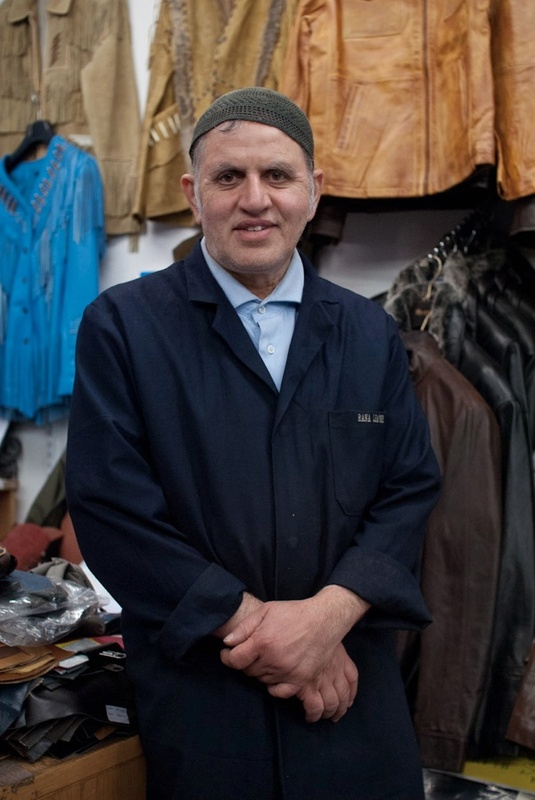 Mr Mahmood, Brick Lane Boutique, started as a machinist twenty-six years ago. 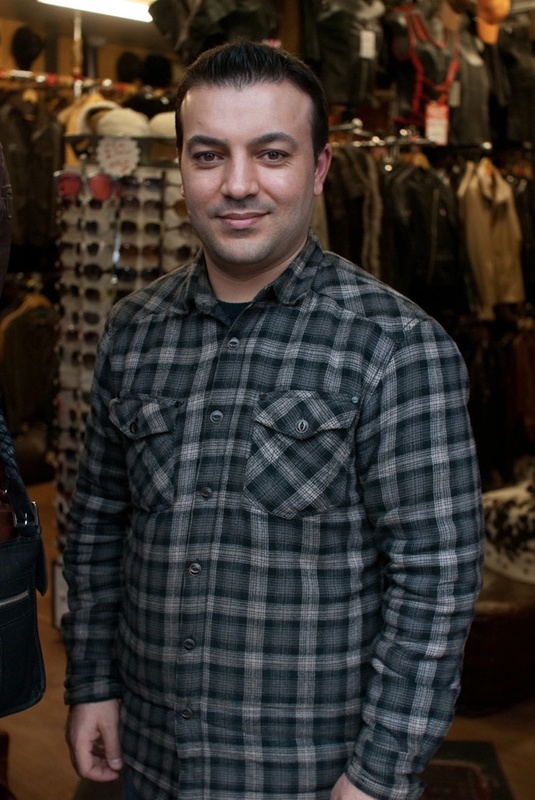 Ahmed, proprietor of Oceanic Leather. Hiya, I would like some real leather trousers. What is the cost? Do I need to order beforehand or do you have them ready made. I have had a leather safari jacket for 40 odd years.Size 42 chest.Made by “Suede and Leathercraft Ltd”.It is now worn and hard.Would appreciate any ideas for a replacement. Hi just come down and see what we can offer, or call us on 0207-7299859 and ask for Barry. We can make anything to order, size and colour. This is great pleasure for us to introduce ourselves to you as a leading and well known manufacturer,exporter,importer and supplier of leather and textile garments in which include leather jackets,pants,suits and all kind of gloves on behalf of our company named as PAKZAIB INTERNATIONAL situated in Sialkot the business city of Pakistan.For more details please visit our web:WWW.PAKZAIB.COM . We assure that our services and offers will really facinate you a lot . Leather Belts and All other products of Leather and so on. We would be great full to you for response us. Our product’s have 1 year Time guaranty. Let’s try us for short trail order. Here the following details of my company. I need a supply of leather belts wide enough for big buckles etc depending on quality a regular order is guaranteed. Hey Andy I would like to offer you the best quality as per your requirements. We are not big but I can assure you can find us best. 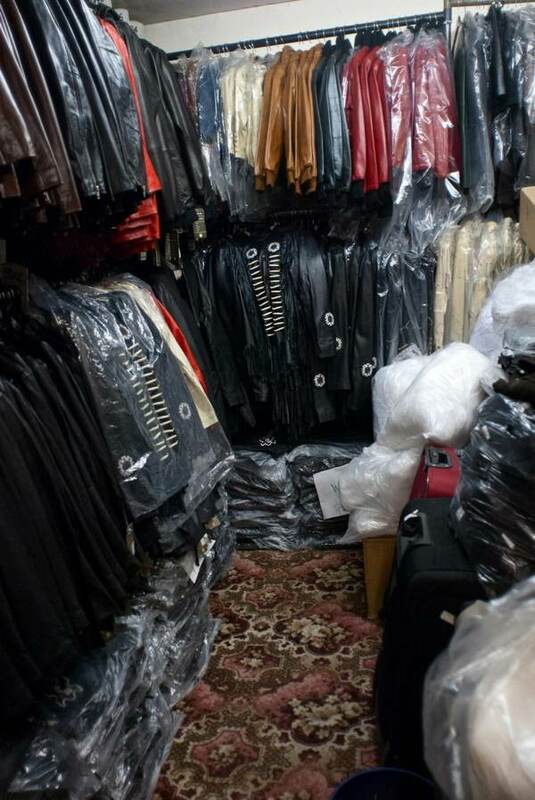 I am Muhammad Irfan from London, a representative of leather jackets manufacturer in South Asia, we have been doing really well in Asian region now we have decided to expand our business and recently started to explore this side of Europe for our leather market. We make jackets from all kind of leathers including buffalo, cow, goat and sheep skin depending on our customer’s demand & quality of leather they want. 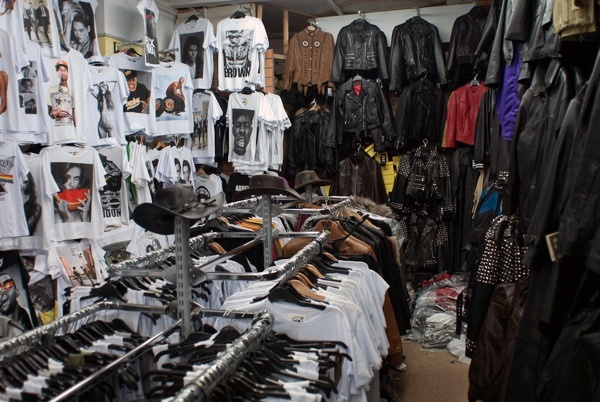 We produce best quality leather jackets with cost effective prices. We can provide you jackets of any design you like and quality you love, I am sure that you will give us chance to prove our words. Hope to listen from you soon. My contact details are given below. 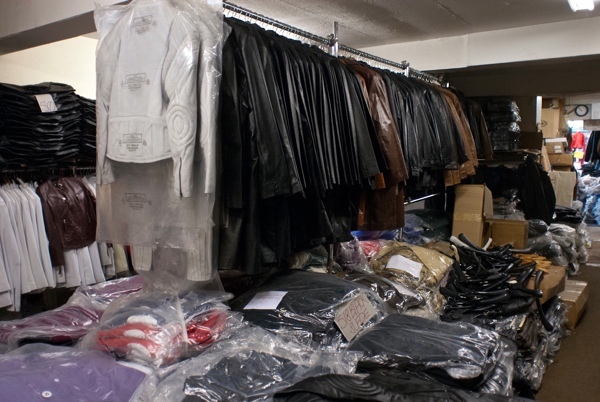 We are manufacturers of leather garments and We mainly supply all kind of leather ladie long coats, Raw leather, MoterBike suites, Jackets, all kind any Gloves, Pents, Leather handbags Motor Bike, Cross Country Gloves, Dressing, Cycling, Golf, Batting, Mechanic, Horse, Riding Gloves, Garding Gloves, any other.Etc, , with best manufacturing, 100% best quality with Competative Prices. …..and anything you ordered we can made . Office:- Nai Abadi Talwaran Mughlan Jammu Road, Near New Cannt Public School Sialkot Pakistan. We are well established for the above mentioned products. Kindly visit our company website http://www.geerysports.com and let us know interested products. So, we will quote you most comprehensive prices for mutual business benefits among both of our organization. We are waiting your prompt reply. I hope, you’re doing good business and in perfect health. 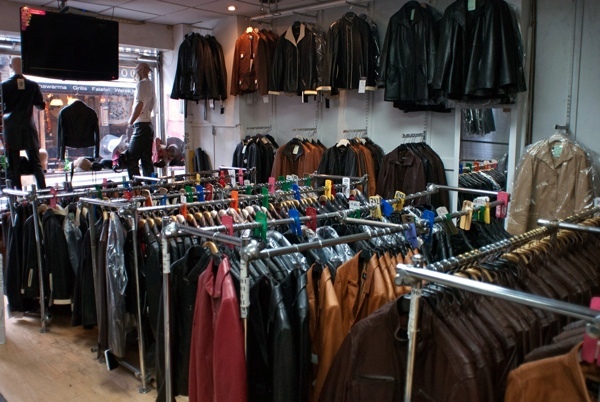 SHATZ TRADERS are pleased to introduce our self that we are Professional Manufacture & Exporters of all kinds of Leather Wear, Specially Leather Jackets, Leather Coats, Leather Gloves, Motor Bike Jackets & Motor Bike Gloves – Since 1992. In order to make production for international brands, we have a well equipped and organized unit in Sialkot enabling us to manufacture in excess of 50,000 to 100,000 products per month. We have a strict quality control in place with the services of very experienced staff of the gloves industry and a chain system in our garments production line up. We are selling our product mainly towards Europe, USA, Canada, Australia, South Africa, and Mildest. We believe in providing fair and honest services to our valued clients. Our production for the famous high street brand names for world, testifies the quality of our products workmanship. We would like to be your one stop source for all of your needs. 1- Sialkot Chamber of Commerce & Industry Sialkot. 2- Pakistan Gloves Manufacturers & Export Association Sialkot. I hope, you guys I like to work us. For more details contact me. Hope you are fine and doing well in respect of business. This is Ghulam Mustafa from Speed Meet International Sialkot-Pakistan. and so we would like to present our products to you and your appropriate team. I , and my staff, look forward to hearing from you soon. I would like a pair of black soft leather jeans made in a size 6 along with a short black plain leather skirt size 6 please. Can anyone who can do please contact me. We hope you are fine and doing well. I wish to work with you for a long time. I’m just coming through your website I am very impressed by your products; I admire all your leather jackets & vest coats clothing, That’s why my extreme desire is to become a part of your business as a supplier. I’m sure we are able to fulfill all your demands. 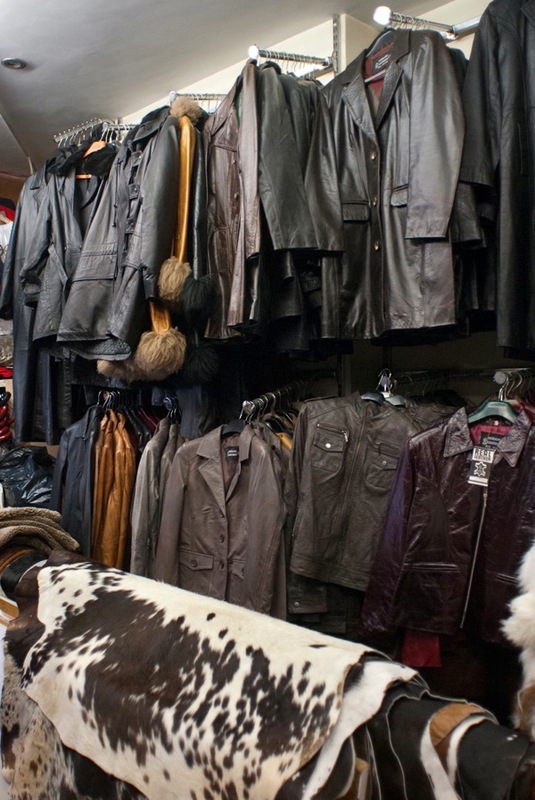 FOX LEATHERS is pioneer in the manufacturing of leather jackets & vest coats clothing since1999, Including Leather pants wear and leather gloves. Our sales team requests you to allow us to send you samples to provide the opportunity to test our workforce. At the same time, this will let you see for yourself the quality of materials and finishes. In achieving this goal collectively we are fervently waiting for your optimistic remarks. We take this opportunity to introduce our self as a leading manufacturer/Exporter of all kinds of leather jackets, gloves, accessories etc. We are exporting our products in various countries of the world. Please feel free visit our website http://www.sanityind.com let’s know your requirements.visit my facebook. Due to our fine quality and highly competitive price, we have a good reputation in the world market. Our management has decided to expand the business in your country and looking forward trust-worthy buyers. We hope you would show your kind interest in our products and like to check our samples. We are very confident by looking our samples you can easily assess the quality of our products and workmen-ship. Thanks for your kind co-operation in advance. 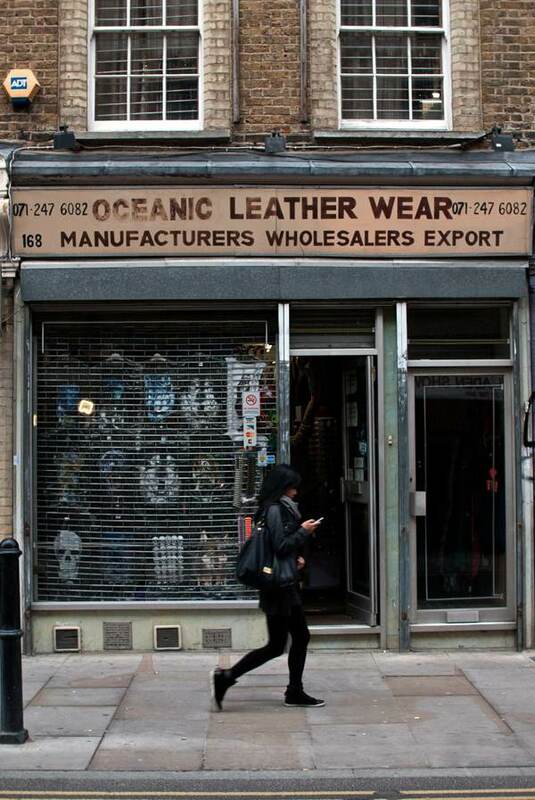 The only Real Leather shop which still does Manufacture All leather goods in Brick Lane.